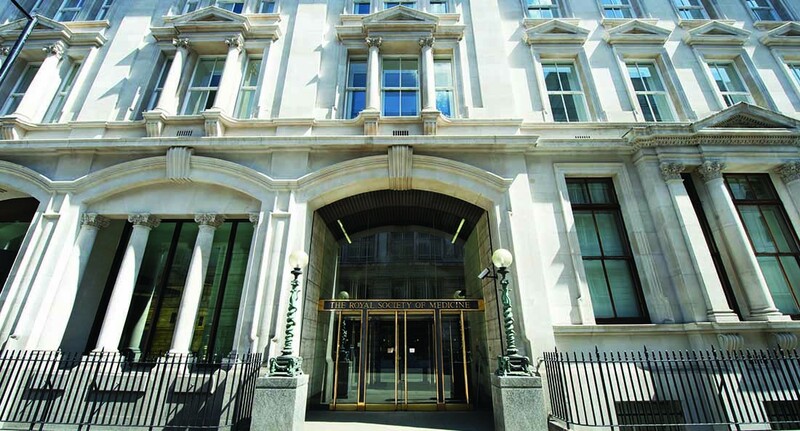 The Royal Society of Medicine’s Digital Health Section holds regular meetings on the latest developments in digital health. On February 26th 2019, attendees convened on the RSM’s home in central London to hear from prominent speakers on the subject of Artificial Intelligence (AI) in healthcare. Entitled ‘Recent Developments in AI & Digital Health’, the meeting explored the application of AI in research, diagnostics and drug discovery. To watch the summary videos of the conference talks, click here. Catch up with the Twitter discussion from the event here. Turns out AI is a popular topic. Although the Digital Health Section of the RSM is well known for delivering high quality events and conferences, for this AI-themed event we found ourselves moving into a larger venue and releasing more tickets to meet demand. Clearly there’s a strong appetite amongst healthcare and industry professionals to learn more about this emerging technology. Or perhaps there’s a prevailing sense of scepticism about how much AI can really ‘revolutionise’ healthcare. For all the talk of machine learning algorithms, natural language processing and synthetic data, I felt a strong disconnect between the solutions on show and their proposed implementation within an institution that is yet to move away from archaic technologies like pager systems and fax machines. Nevertheless, the discussions and ideas shared on the day went some way to addressing preoccupations about how AI might shape the future of healthcare both in the UK and on a global scale. Included here is a brief summary of the conclusions drawn from the day by the speakers who contributed to the conversation. You can see a full list of the speakers and their presentations here. According to a Lancet report from 2015, 5 billion people in the world lack access to safe and affordable surgery. In order to meet this demand, the research suggests an additional 2.2 million surgeons are required over the next 15 years. The Royal College of Radiologists published a report in 2016 that showed 25% of breast screening units are understaffed in the UK, with 13% of breast radiologist posts lying vacant. It is issues like these that companies like Digital Surgery and Kheiron Medical are attempting to solve in surgery and breast cancer screening respectively. Across the board, the medical workforce has failed to scale in order to meet ever rising public demand. Could AI technologies be a part of the solution? In the case of Digital Surgery, it’s about providing a suite of tools that deliver an end to end surgical support solution from education to operation. Whereas for Kheiron Medical, the integration of a deep learning product into the breast cancer screening workflow could go some way to making up for the lack of radiologists. The initial training of Kheiron’s deep learning technology used mammograms from Hungarian citizens. Although the company are now testing the technology against existing scans from trusts in the UK, we have to wonder whether there should be more collaboration between institutions like the NHS and companies like this who want to explore novel tools for providing better workflows and patient care. Unfortunately we live in a world where the rate of technological advances is far outpacing regulatory oversight. There is a culture clash between the ‘move fast and break things’ ethos of the tech world vs the safety-first model of modern public healthcare delivery that can make collaboration and cooperation difficult. Perhaps then it is the role of research hospitals like UCLH to provide the platform for testing and integration of novel technologies into mainstream healthcare. In 2018, UCLH announced a new partnership with The Alan Turing Institute that aims to bring together data science and artificial intelligence to support clinical decision making. This new partnership ensures the right ingredients are present to develop a successful research hospital. These include specialised facilities, translational expertise and academic training. Aside from working towards discovering new treatments, developing partnerships in the public and private sector, and ultimately creating new companies, the key focus of institutions like this should be to figure out how to successfully operationalise AI. Many may be concerned about the prospect of increasing cooperation and integration of the private and public sector in the development of novel AI technologies. Phrases such as ‘privatisation by the back door’ are thrown around perhaps without due consideration for the opportunities such collaboration can bring. Nevertheless, the NHS needs to better understand the value of the health data it collects and currently under utilises, and use this as leverage to ensure it can establish fair commercial models between the NHS, patients and industry. Indeed, the patient voice is key to consider as we move forward with AI. One of the problems with any new technology is the assumption that it is in itself a solution. Whether it’s AI, VR or blockchain, many companies and entrepreneurs look to see where they can be applied rather than using the initial problem as the starting point. With health data and the value it contains, it would be unwise to throw a myriad of new technologies at it simply to see what sticks. The right approach is to start with the problem or the user/patient need and let that guide the development of the solution. Perhaps it requires non of the technologies above. We can’t just assume that digital technologies will always make processes faster and more efficient. In some cases it simply won’t. So while we explore the opportunities that AI might provide healthcare, we need to keep patients at the heart of the process and understand that it’s not just about educating them about these new technologies, but bringing them along for the journey of discovery. This is a journey that will inevitably require iteration, failure and mistakes. Perhaps the greatest threat to AI in healthcare would be developing the regulatory and governance models that guide the use of health data to develop these technologies, without integrating patient perspectives into the process. The model for co-opting patients into the development process is best illustrated in low and middle income countries where AI is aiming to improve access to healthcare. Both Babylon and Ada Health are deploying digital technologies in resource-poor settings in order to make healthcare more accessible. The lessons from these companies is that solutions and products cannot simply be forced on a population through a top-down approach. The context of communities at the local level is vitally important to understand. Existing healthcare structures need to be supported and local healthcare organisations need to be partnered with in order to gain trust and demonstrate credibility to end-users. The AI itself needs to be sophisticated enough to understand the nuance of culture and language which might affect how someone interacts with a chatbot and gains accurate medical advice for example. One of the main conclusions from the conference was the idea that AI can’t solve the structural problems that currently exist in healthcare. Although there was much promise from the companies and institutions on show during the day’s presentations about the future, there is much that can be done now to ensure that the basics are done right in order to make healthcare faster, better and cheaper. This might be in the domains of electronic health records, the coding of quality health data and making digital health systems interoperable. Nevertheless, a comment about AI that has stuck with me speaks to one of the key outcomes we should push for when implementing these technologies. Arguably the greatest potential of AI in healthcare is providing the ‘gift of time’ — allowing healthcare professionals to spend more time actually caring for patients (arguably one thing that an AI will never be able to do) and less time burdened with bureaucracy and administrative tasks. It might be hard for your average GP to see how AI is going to help them manage the social aspects of care — a homeless patient with multiple co-morbidities or an isolated elderly person with worsening dementia — but it can at least aim to give them the opportunity to be the compassionate, holistic medical practitioner they were trained to be. There was a call during the conference to rename Artificial Intelligence to something more accessible and understandable. Augmented Intelligence was proposed (at least it preserves the acronym). Whatever we ultimately decide to call it, it was clear from the presentations that AI is here to stay. Whether we believe the hype or not, AI is being integrated into the plans and processes that will define the future of health in this country. We should all strive to contribute to the conversation.